A full assault is happening in Benghazi right now. 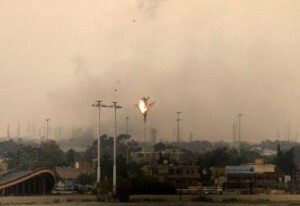 Rockets and bombing have rocked residential areas. Tweets of civilians being shot as they flee their homes. Tweets also of assault from the sea. The hotel where journalists stay has been bombed. All hell is breaking loose. What did the United States, United Kingdom, France and the Arab League think was going to happen? Gaddafi’s regime promised no mercy and no pity. Did they really believe the tale of ceasefire? Can any intelligent person believe anything Gaddafi or his regime says? While NATO fiddles with rules and meetings and agendas, Benghazi burns and more Libyans die or are maimed. Do what you have to do NOW. Time has run out for the Libyans.